Best suited for a controller due to the odd mouse controls, often unmarked keyboard prompts, and flawed key rebinding. 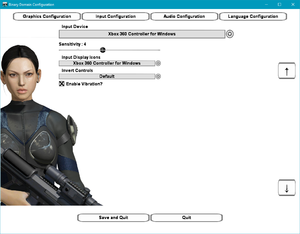 Most graphical options have to be set through an external configuration utility. Aspect ratios narrower than 16:9 are letterboxed (use Flawless Widescreen). 20-80° (vertical). The slider text always shows 20 degrees when the configuration tool is re-opened (the actual setting is remembered correctly despite this). External keyboard and mouse settings. Keys such as ⇧ Shift, Ctrl, ↵ Enter, Backslash, Delete, and other special characters cannot be remapped. For left-handed players this means many of the keys around the arrow keys cannot be mapped. Along with the X axis and both X and Y.
Xbox One controllers will not work properly in-game. To fix this disable the appropriate 'HID-compliant game controller' under 'Human Interface Devices' in Device Manager. 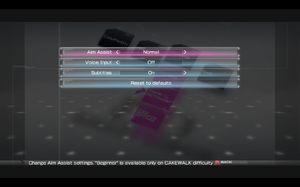 Choice of Xbox or keyboard prompts under Input Configuration. Fan translation by «ZoG Forum Team / ENPY Studio» link #1 #2. The game features characters speaking in Japanese, although individual subtitles for these dialogues are not provided. Global subtitles have to be enabled instead. 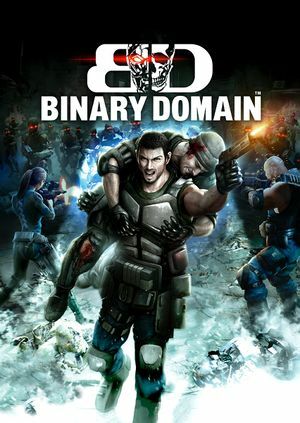 See Helix Mod: Binary Domain. 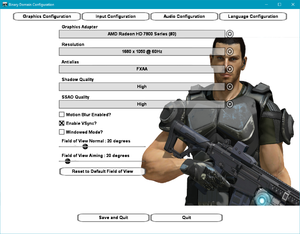 In certain AMD CPU + GPU configurations performance will be extremely low when engaged in combat. Normally the game shows you the Xbox 360 buttons for the buttons you have to press. 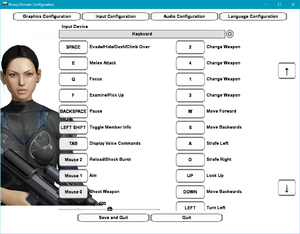 You can change this in the configuration utility of the game under the Input configuration tab. Open the Graphics Adapter and Resolution lists and select the correct option for each (even if it is already highlighted). Choose Save and Quit to apply the change. Right click on BinaryDomain.exe and select "Properties". 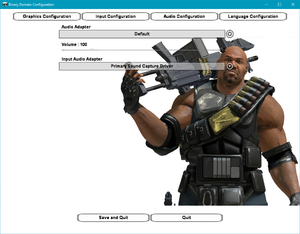 Run the configuration tool and select "None" as "Input Audio Adapter" on the audio configuration page. ↑ 2.0 2.1 File/folder structure within this directory reflects the path(s) listed for Windows and/or Steam game data (use Wine regedit to access Windows registry paths). Games with Steam Cloud support may store data in ~/.steam/steam/userdata/<user-id>/203750/ in addition to or instead of this directory. The app ID (203750) may differ in some cases. Treat backslashes as forward slashes. See the glossary page for details.